I still pen the occasional piece for Moonletters, and Shauna is mad enough to publish them! So, I’ll continue to post new posts here, just for the record. Why not catch the mystery tour? or go to The Gallery and look at some pics. or keep death on the streets, riding mopeds! and steal a few kisses. are the best by a mile! And who do we thank for all these great things? Is it some sort of angel, with ruddy great wings? there’s only one person who wears the crown. some gems from the rubble. as anyone will tell ya! This one’s for all you budding Spielbergs, Tarantinos and Bigelows out there who find themselves frustrated by the problems posed by SL when capturing even the simplest sequences for your future Oscar-winning production. Before I go further, I’ll admit this is a quick and dirty hack that’s only really suited to the simplest of scenarios – your mileage may vary considerably – but, on the plus side, it’s free, easy, and could make your productivity far less fraught. The big problem with capturing video of what’s going on in SL is the juggling act that machinima makers have to perform in order to operate their screen capture application of choice, whilst simultaneously navigating an avatar inworld and, at the same time, control the camera to get dynamic, fluid movement and perspective into that crucial take. Traditionally, the favoured solution is a 3D mouse, like the Space Navigator, but it’s not exactly cheap, can be a pain to install and set up, and if you’re going to do it right, you’ll need your other hand controlling your normal mouse at the same time – great results, but probably only for the experts. Alternatively, you can open two instances of the viewer and drive yourself mad trying to control both, whilst your computer goes into meltdown as it struggles to cope with the pressure! 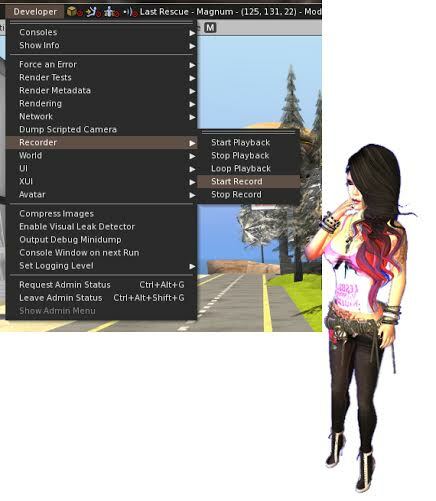 There are, of course, inworld systems that you can find on Marketplace, that allow you to take control of both camera and avatar and set up the perfect shot – again, these can be pricey, a fiddle to set up and might not work at all if you can’t build or run scripts on location. So, what do you do if you want to create an awe-inspiring tracking shot that zooms in from a distance as your avatar walks shiftily through the wastelands of a post-apocalyptic landscape; and you want to do it completely, within budget and without a crew of hundreds helping out in the background? You can now use the playback options to have your avatar repeat their journey as many times as you wish, whilst you control the camera to get the perfect shot. As I mentioned, this isn’t always the most reliable tool – try to avoid any obstacles and stick to short sequences, if possible, or you may find yourself flying unexpectedly through the air! It is however a useful and quick means for grabbing footage on the fly for later editing into your masterpiece, without all the hassle of additional equipment and a nervous breakdown! Shauna recently posted a Torley Linden video tutorial giving you the lowdown on how to grab texture information using the viewer’s built-in functions. It’s a great tip for getting to the bottom of why some textures take an age to load, and although it won’t speed them up, it can stop you from falling into the trap of trying to refresh a texture that’s taking an age to show up; forcing the viewer to reload it is just going to make it take even longer! Like Torley explained – bigger is not always better. Think of a 1024×1024 texture as being 4K Ultra HD – that’s way beyond what most people want or can handle – 512×512 is a good compromise, with plenty of detail for covering large areas and a reasonable load time for the vast majority of people. Tailor your textures to your surfaces. If you’re texturing a strand of hair, a tiny texture is fine – ever wondered why your favourite hairstyle plunges you into lag hell, even after deleting the scripts? It’s probably because every single strand has been given a 512×512 texture, and your poor graphics card is trying to render masses of them in real time. If you’re making regular repeating shapes – signs, paving slabs or tiles – try 128×128, it makes a big difference. Textures don’t have to be square – as long as you stick to the normal ratios (64:128:256:512), you’ll be fine. So, for example, if you’re making a rectangular neon sign, use a rectangular texture – 256 long by 128 high. It’s also easier to visualise what the end result will look like, rather than trying to squish a square texture into a rectangle. And, most important of all: Make those textures work for you! You can fit four 256×256 images on a single 512×512 texture – your graphics card only has to load one texture to render all 4 images, it’ll be quicker, and you’ll save yourself L$30 uploading! Once uploaded, use ‘texture offset’ in the build floater to isolate the image you want. Why stop there? You can fit even more, smaller, images onto a single texture and there’s absolutely no reason why you shouldn’t – I’ve managed to texture a whole building, inside and out, using just a couple of textures in this way. Everyone wins! Ever waited for an age for your AO to place your avatar in exactly the right position for the perfect screenshot? Ever had a picture ruined because when you try to stand in the best spot, you sink up to your waist in a phantom sculptie? Ever been driven to distraction by your clumsy attempts to place your avatar exactly where you want it? Well, there’s a little known trick, buried away in your viewer that might just dig you out of that particular hole next time you find yourself struggling. Best of all, it’s quick, easy, works anywhere and nobody watching will know what you’re up to! First, you need to enable the viewer’s Developer menu – this is switched off, by default. In the Linden viewer, it’s‘Me > Preferences > Advanced tab > Show Developer menu’; in Firestorm, just press [CTRL]+[ALT]+[Q], together. In the developer menu, select: “Avatar > Character tests > Allow select avatar. This is where the magic happens! You can now move your avatar through the X,Y, and Z axes using the Edit floater. It’s a bit fiddly to initially select your avatar, so the simplest way is to right click on any prim or mesh you’re wearing and select ‘Edit’, then left click on part of your avatar – careful not to click on another prim! Now you can move your avatar to the perfect position. This is a local effect, so only you will see it, and it’s not persistent over sessions. Bonus hack: You’ll also find the ‘Animation Speed’ option in the Developer menu, which allows you to speed up or have super slow-mo animations for your own avatar – brilliant for machinima. Again, this only shows on your viewer, everyone else sees you normally. Those of you who do not know Shauna as well as myself will be unacquainted with just how scary she can be when she wants something done, so when she suggested I might want to post an occasional ‘How to…’ for Moonletters, with that steely glint in her eye, and a baseball bat behind her back, how could I possibly refuse? 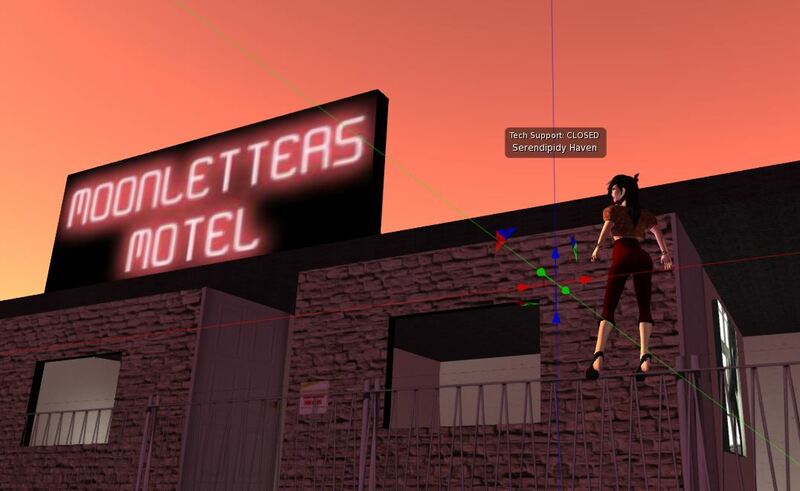 Here’s a simple little hack that inworld photographers especially will appreciate. You can only do it with a viewer that has a built-in client side AO – as far as I know that’s only Firestorm, Singularity and Dolphin – but if there are others, I’m sure somebody will shout out! 1. Open the built-in viewer AO by clicking on its button. 2. Create a new group of poses by clicking the ‘+’ button and typing a name into the box, then click the checkmark. 3. Give it a second to set up, then you can simply drag the poses you want from your inventory into the AO. 4. Use the up and down buttons to arrange them in any order you want. To use your poses: Simply turn off any scripted AOs you have running and click the little checkmark box on the viewer AO button. To switch between poses, click the AO button and use the right and left arrow buttons at the bottom of the floater. You can create as many pose groups as you like – select which one you want to use from the top drop-down list. Now, where’s Shauna gone with that baseball bat?